highlighting the new Google Analytics. The new version of Google Analytics is currently available in beta to all Analytics users. And follow Google Analytics on Twitter for the latest updates. This week, Gilles Roux, an Analytics engineer will discuss some recent improvements to custom reporting in Google Analytics. Creating custom reports in Google Analytics is a great way to answer specific questions about how users interact with your website or keep track of the metrics that really matter to you. Since releasing the new Analytics earlier this year you have sent us lots of great feedback. Thank You! We have been hard at work integrating some of your suggestions and adding new features that will make custom reports more useful and easier to use. 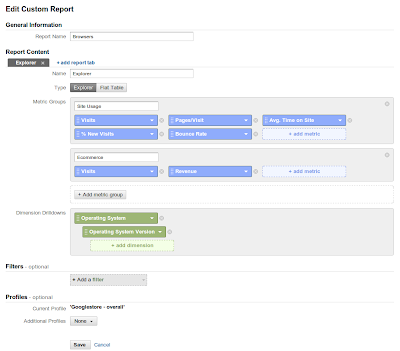 The custom report builder has an updated look and feel that simplifies the process of creating and editing custom reports. The sections are now clearly labeled, with optional settings at the end, and the metric groups are shown on a single page without the need to switch tabs. We have also added the ability to quickly reorder metrics and dimensions using drag and drop. We hope these improvements will help you create reports that look just the way you want, in just a few minutes. We know - when it comes to analyzing your website usage, the more metrics the better. That’s why we have enabled 45 additional metrics and dimensions inside custom reports. These cover a wide variety of areas such as mobile, social, goals, site search, e-commerce and advertising. 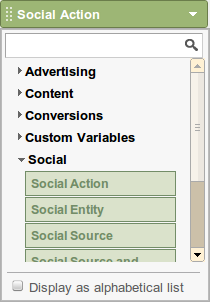 All metrics and dimensions are now organized in categories to make the list more manageable. When viewing a custom report that has an explorer tab, you will now be able to select a secondary dimensions, which can be useful to perform a deeper analysis of your data without having to make changes to the custom report. 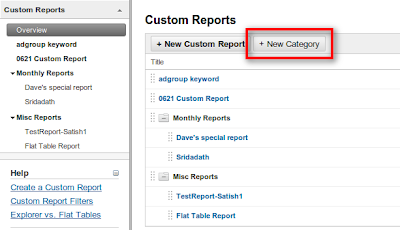 The custom reports overview page is the central place to view and manage all your custom reports. You will now notice a ‘New Category’ button to create your own categories, in which you can group related custom reports. You will also be able to reorder reports, for example to make sure that your most important ones are conveniently shown at the top of the navigation. We hope these improvements will help you create powerful reports that are targeted to the specificities of your site. As always, please don't hesitate to send us feedback, and expect more features in the near future. This is part of our series of posts highlighting the new Google Analytics. The new version of Google Analytics is currently available in beta to all Analytics users. And follow Google Analytics on Twitter for the latest updates. This week, Gilles Roux, an Analytics engineer will discuss some recent improvements to custom reporting in Google Analytics.